It began on New Year’s Eve when I offered to cook dinner for my boyfriend and his family up in Yorkshire. Knowing that on New Year’s Day we might be nursing various degrees of hangover, and that the shops would be shut – or operating on minimum opening hours with a likely lack of any fresh produce – we hit the local market to stock up on ingredients. Fresh fish, bread, cheese, vegetables and various spices secured, my attention (surprise surprise) turned to pudding. Wanting to make something comforting yet impressive for this family feast, I opted for a twist on a British classic, treacle tart. An apple, maple and pecan treacle tart to be precise, barely adapted from a recipe I found in Jamie’s Dinners. Short, flaky pastry encases a filling rich with sweet, syrupy breadcrumbs, melting flecks of grated apple and studded with crunchy pecans, providing a warm, comforting hug with every mouthful, while a zing of orange zest and a pinch of spicy cinnamon keep the flavour far from flat. We ate the tart ever-so-slightly warm, topped with scoops of vanilla bean-flecked ice cream which melted slowly through the cracks of crumb of contact. Seconds, and in some instances thirds, were devoured before we retired to watch TV, in front of a (completely unnecessary in this mild weather but oh-so-cosy) open fire and surrounded by boxes of chocolates. Stuffed, happy and surrounded by family, this was perfect way to end the Christmas holidays. Fast forward almost a week and we’re back down in London. Everywhere I look people are making resolutions, giving up chocolate or going on detox diets to shift the Christmas bulge. Blogs are filled with cleansing juices, nourishing soups and seven ways to fashion a simple supper from a lettuce leaf. It’s a bad time to be a treacle tart. But to be completely honest that’s not the reason I’m not sharing the recipe here today. I’m not a fan of such abstemious New Year’s resolutions – it seems so sad to deprive yourself of any indulgence in what must surely be the most depressing months of the year. No, the reason I’ve gone down a different route is because in the excitement of New Year’s Day I completely failed to take any good photos of the tart, and it’s far too lovely a pudding to be posted without its very own portrait. It was pitch black by the time we got round to eating supper, my iPhone was upstairs (no, I’m not normally that lazy but this was Christmas), and even if I’d wanted to take some snaps the hungry hoards would probably have staged a revolt. Sorry. Instead I’ve created a dish inspired by my apple, maple and pecan treacle tart, rich with the flavours of winter but altogether far more virtuous. Pear replaces apple for its less acidic qualities and soft, almost buttery texture – a nod to the short, flaky pastry which has no place here. Porridge oats are soaked until soft in a mixture of apple and pear juices and milk before combining with yoghurt for a smooth, silky finish. Pear and walnut is a classic savoury combination, but with breakfast or a dessert I prefer the sweeter, smoother option of pecans – here they work wonderfully in contrast to the oats, creating a finish that is both crunchy and creamy. Finally, the whole thing is finished with a slick of maple syrup, a pinch of cinnamon and a scraping of clementine zest for extra zing. Pour the oats into a bowl and cover with the juices and milk. Leave to rest in the fridge for at least 10 minutes (I sometimes do this just before I go to bed so that by morning the oats have absorbed all the liquid to become soft and delicious, but be careful not to leave it too long – it can turn into wallpaper paste!). 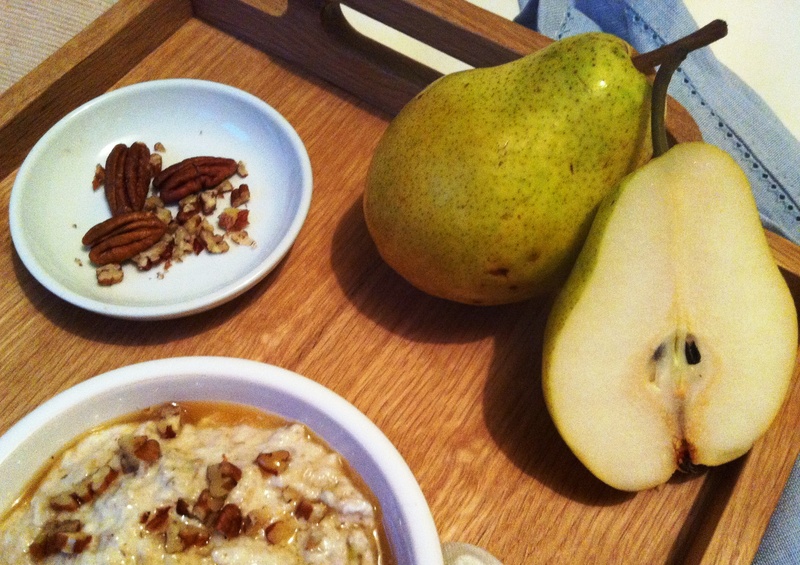 When ready to serve, stir in the grated pear, yoghurt, maple syrup and half the chopped pecans. Divide between two small bowls and sprinkle with the remaining nuts, cinnamon and clementine zest, adding a little more maple syrup if you like. This recipe is also delicious if you add raisins, replace the pecans with almonds or hazelnuts, or the pear with apple. 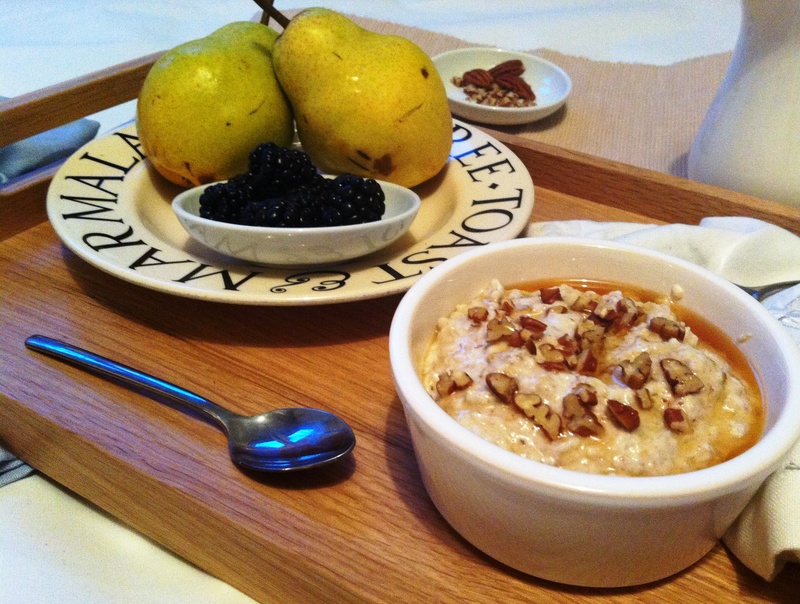 For a more traditional Swiss Bircher Muesli recipe, see my post from earlier in the year here. And if you fancy a more traditional treacle tart, have a look at my version with rosemary sea salt here. I love love LOVE bircher museli. Such a staple. You should stir in some lemon curd. Yummy! I love Bircher Muesli. Adore the creaminess of it even if you soak the oats in water, but can’t wait til tomorrow to try it with the apple juice and milk mix. Pure luxury! I am such a muesli novice but this looks amazing! Ahh loved this story. I really don’t like resolutions and as I’m sure you’re going to tell from a post I’m about to make, I’m not really acknowledging a new diet in the new year. 😉 Haha, I laughed at “it’s a bad time to be a treacle tart.” Shame you couldn’t post it! But I honestly love muesli, and this combination of flavors sounds sooo good. I’m gonna try it out! Loaf, what an incredible breakfast! 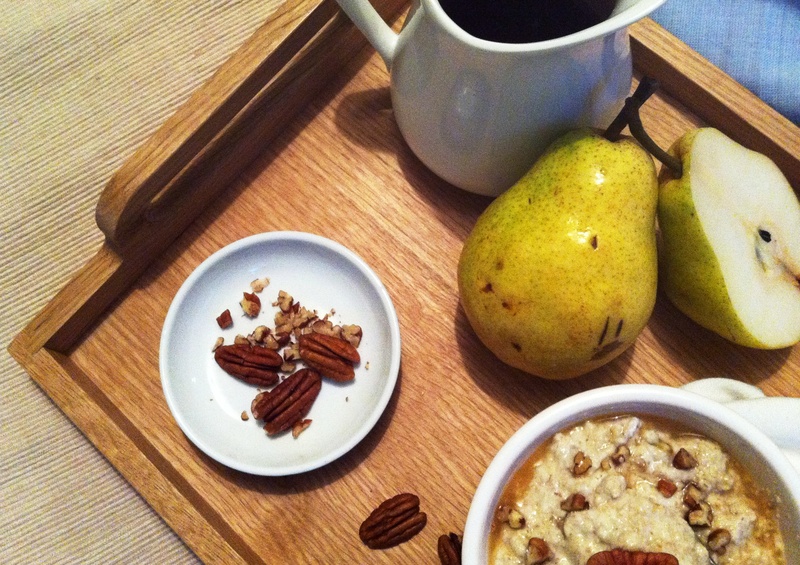 I love the tray too :D. My breakfast usually consists of camomile tea. I should try spicing it up a little like you have here. Urvashi – ooh, I’ve never thought to try lemon curd. Sounds yummy. Kathryn – it’s so simple and so good, do try it! 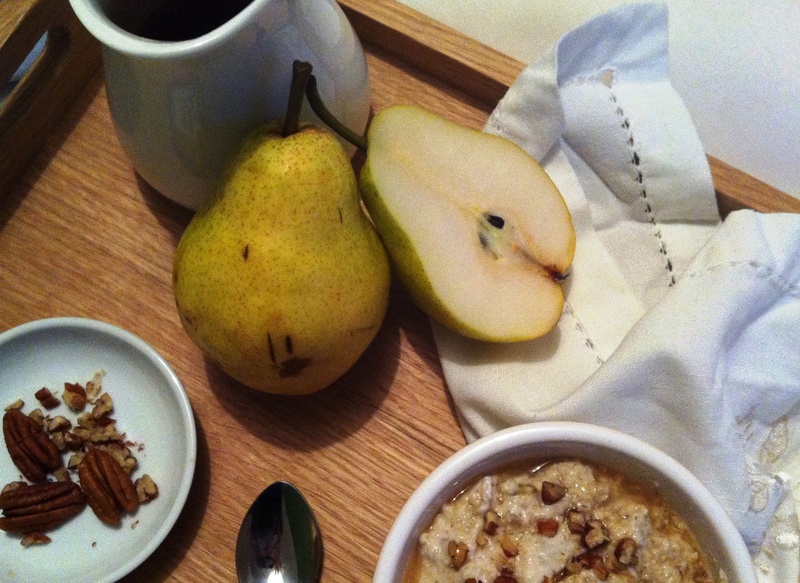 Gluten Freezen – the pear is lovely – a bit more buttery and rich than apple but equally delicious. Amy – just read your post, it’s amazing 🙂 Flourless chocolate cake is heaven. Bircher Museli is such a nice way of having a healthy and satisfying but delicious breakfast. Like the addition of maple syrup. We’re still working our way through boxes of christmas chocolates at work and at home! Oh this sounds so good. Virtuous yet luxurious. And no I’m not detoxing or dieting, so I will also be looking up the treacle tart recipe too! Wishing you all the best for 2012 with lots of yummy things to eat (in case I haven’t already – rather losing track)! Looks delicious. We first discovered Bircher in 1979 and have been eating it every weekday morning ever since – now that is scary! Oh I do love bircher but haven’t had it for a long time! Even though I’m not really that keen on pecans, I think I couldn’t leave them out if I am going to try this recipe, sounds delicious! I have been eating a lot of similar breakfast combos lately. And in fact have been meaning to blog about it…. 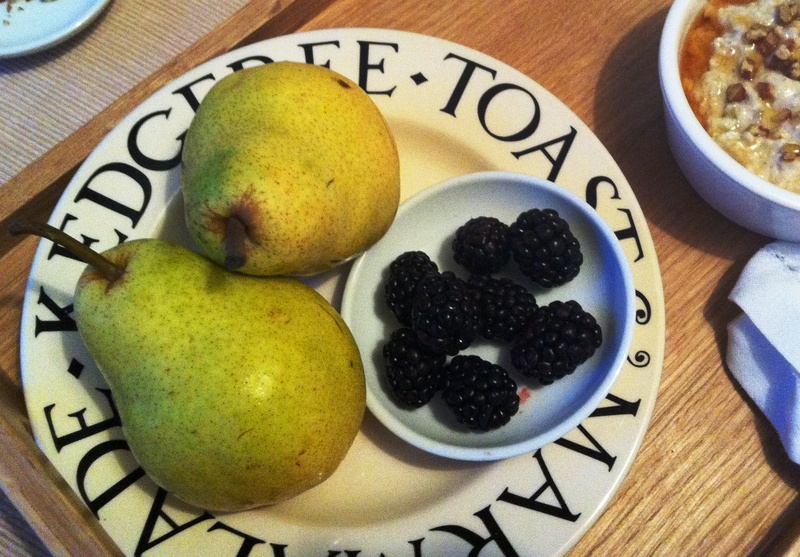 We must be of the same taste;) The juicy pear slices are keeping me happy this winter! Mandy – haha, I know how you feel – our cupboards are still stuffed with chocolate! Vanesther – hope you like the muesli and the tart! Choclette – I’ve had cream on porridge but never on bircher muesli…might have to give it a try! Make Do Spend – totally agree, anyone who skips breakfast is insane. Shellie – try walnuts or hazelnuts instead! Or if you don’t like nuts maybe substitute some dried fruit? Wow that is fantastic. I love that kind of food. Ruthie – you definitely can. Bring on the summer. Vredni – glad you like it! cookies and cream and PB! what a lovely combination. I would love a couple of these with my coffee right now.